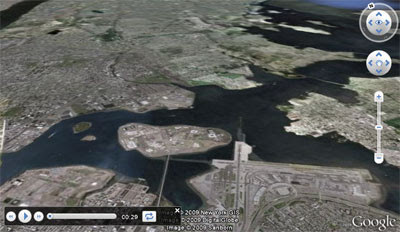 Google has today added many of the features introduced in Google Earth Version 5 to the Google Earth plugin. This is very exciting as it means it is now possible to explore the world's oceans underwater, record and play back narrated tours, view historical imagery, and explore Mars in 3D directly from your browser. As an example, here is a Google Earth plugin tour of Flight 1549 that crashed into the Hudson River, Flight 1549 Crash Re-enactment. The tour uses the narrated tour capabilities introduced today to give you a pilot's view of the plane's last flight with a recording created from the eight audio tapes released by the FAA. It means you can listen to the actual conversations between the pilot and flight controllers whilst viewing a simulation of the flight. The tour was originally created for Google Earth by Jeral Poskey of Da Vinci Global Services. Google have released a number of other demo's of the plugin's new features which you can view from this Demo Gallery. My favourite of the demo's is a spectacular tour of the Grand Canyon. Developers who wish to play with these exciting new features should head over to the Google Earth API's Developer's Guide. Via: Google Geo Developers Blog: Google Earth Plugin Five-O: Ocean, Touring, and More!